This year was the thirteenth year of the Salesforce Dreamforce conference, but my first year attending what Wired magazine calls a “Massive Carnival of Geekery That Eats San Francisco.” Last week, I was super fortunate to be a part of the IAVA Dream Team, along with 160,000 other excited Salesforce customers and partners at Dreamforce 2015 in California. Many of my friends and family outside of the tech world were wondering, what the heck Dreamforce was about… technology? non-profit? sales? scifi convention? gaming? rock concert? Well, it was sort of a little bit of everything all wrapped into one! First, for those of you that don’t know, Salesforce is a powerful cloud-based constituent (or customer) relationship management (CRM) product – basically it helps keep your customer or constituent data organized! IAVA has been using Salesforce for over 6 years to organize our membership and donor information. In 2014 we started using Salesforce Communities to customize and create our new and improved community of veterans, myIAVA. Building myIAVA on a Salesforce Community provides our veterans personalized and customized access to our Rapid Response Referral Program (RRRP) if they need assistance with such things as mental health, employment, education, housing and legal assistance. Our community members also have access to our IAVA GI Bill Calculator, groups, chat, and special events and VetTogethers. 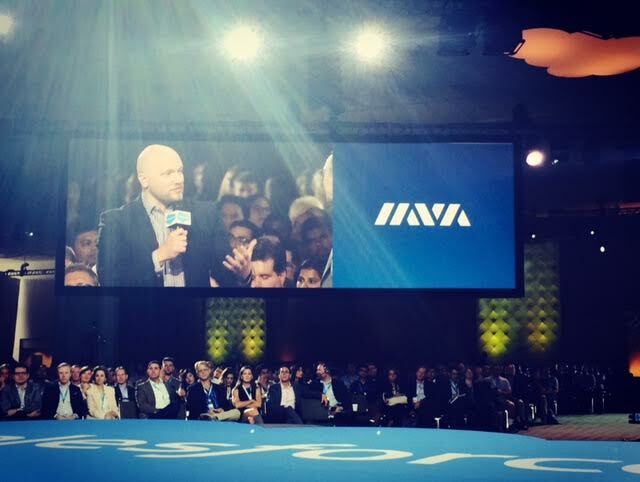 This year, IAVA was not only invited to take part in Dreamforce 2015, but also present on stage! IAVA’s CEO and Founder Paul Rieckhoff was a featured speaker twice on the big stage and his Community Cloud Key-Note session was highlighted #4 of the top 10 of Dreamforce. 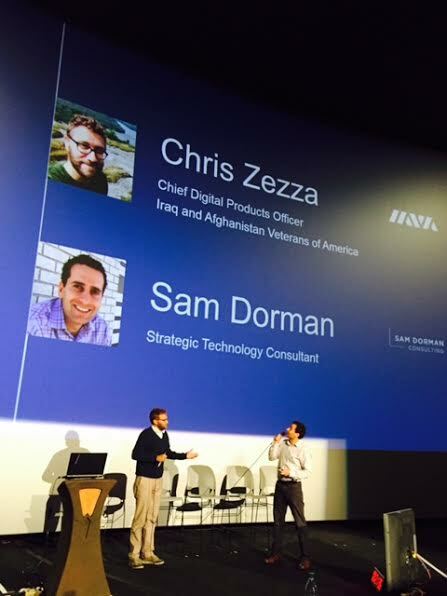 IAVA’s Chief Digital Products Officer Chris Zezza and longtime Strategic Technology Consultant Sam Dorman were asked to present to a movie theater size audience on best practices of community engagement from non-profits. Chris was asked again to join a panel on best practices of communities for connecting government, NGO and non-profits. It was evident just by the way people reacted to us when they saw our IAVA lapel pins, shirts, or gear that IAVA was not only a Salesforce customer, but we are leading the way with innovative customization and practices that other organizations wanted to hear about! 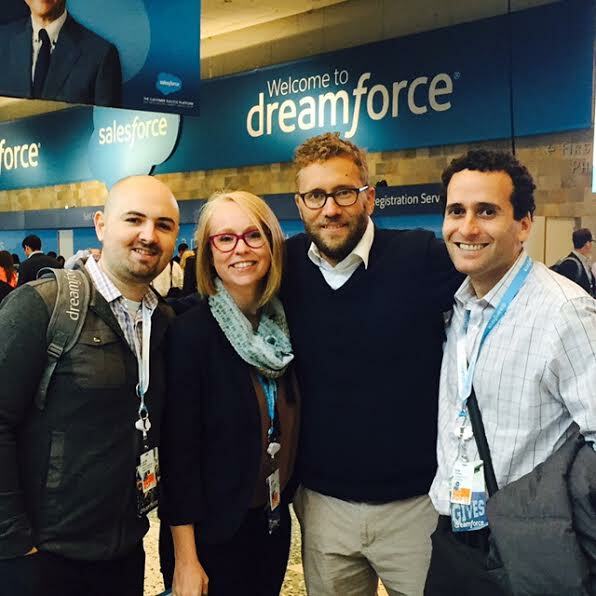 This year at Dreamforce, IAVA was invited and hosted by VetForce. 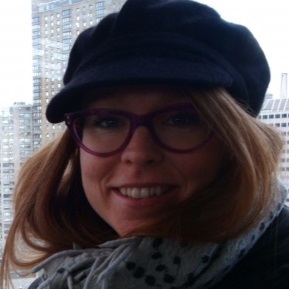 If you haven’t already heard about VetForce, they are an incredible Salesforce organization created to help impact the lives of veterans by helping them gain Salesforce training, certification and related employment. VetForce works with other amazing organizations such as Blue Star Families, VetsInTech and Wounded Warrior Project. Marc Benioff, the CEO of Salesforce, and a well-known philanthropist, dedicated each day of the conference to a different cause, including women in tech and education. Tuesday was dedicated to veterans. VetForce hosted several events to raise awareness on veteran’s issues including an organized packing event for 2,500 Night Night kits to be sent to shelters and organizations to support homeless veterans and their families. On Thursday afternoon, IAVA partnered with VetForce in their VetForce Lounge to host a VetTogether where we showed off our myIAVA community, IAVA website and even signed up some new members! VetForce also hosted sessions on leading organizations’ best practices for hiring vets, helping vets in transition, learning to code and much more. 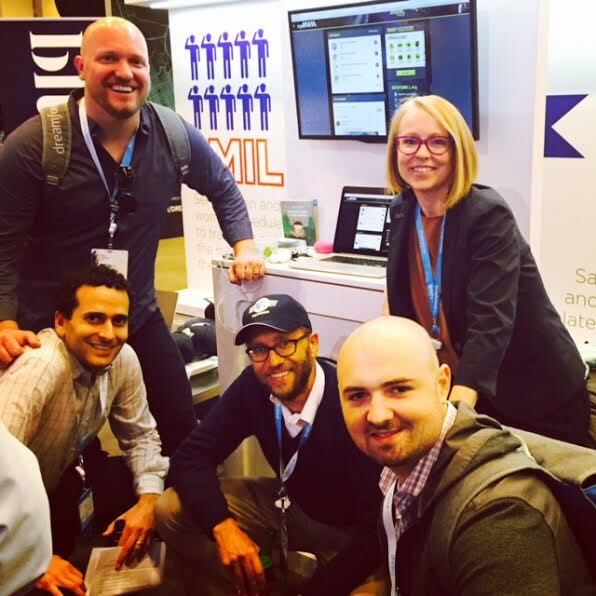 Dreamforce was a crazy, fun-filled week of technology, philanthropy and networking. Salesforce literally shuts down part of downtown San Francisco with built-up grassy areas for lounging in bean bags, listening to live music and activities like oversized chess games. While music acts this year included Stevie Wonder, John Legend, Foo Fighters, The Killers and Gary Clark Jr. – the Dreamforce conference participants also managed to collect over 1 million books for kids in need, making it the largest book drive ever! I am so proud I was there as IAVA was recognized at Dreamforce this year and I’m already looking forward to all of the exciting things to come for Dreamforce 2016!